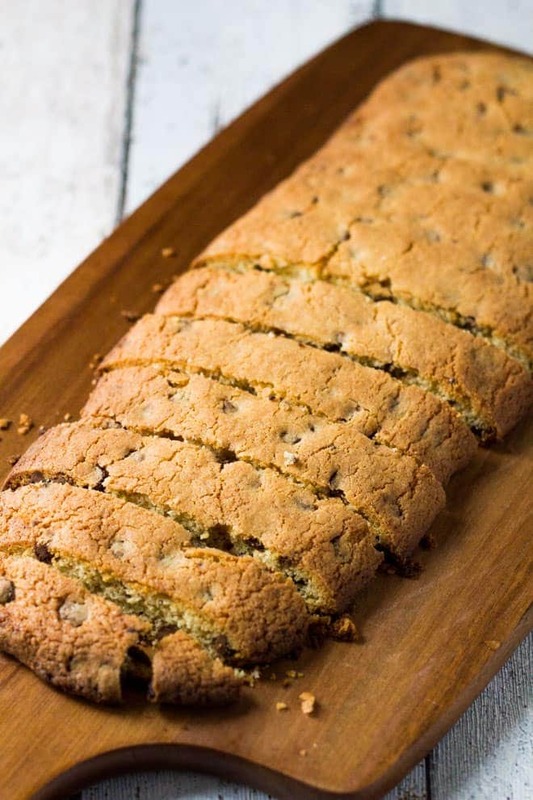 Chocolate Almond Biscotti – Twice-baked crunchy almond flavoured Biscotti studded with chocolate chips. Perfect tea or coffee dunkers! 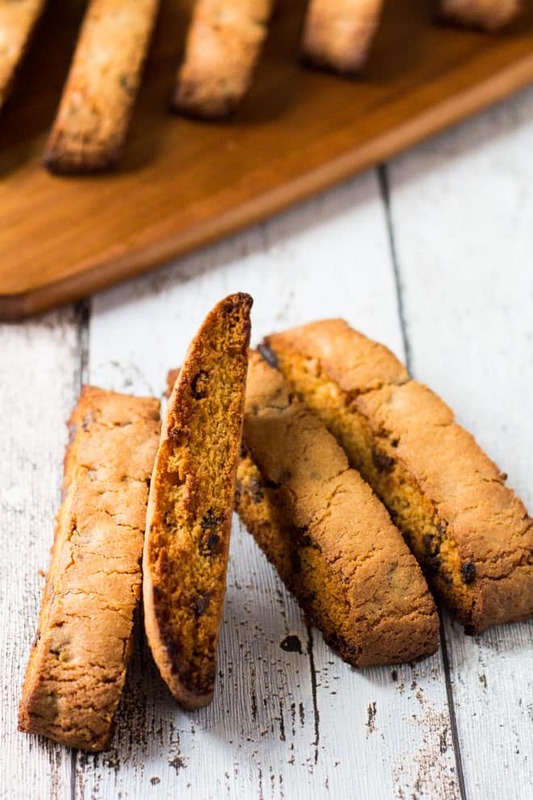 Biscotti, meaning twice-baked in English, are Italian almond cookies. They are twice-baked, oblong-shaped, dry, crunchy, and dipped in a drink. Many love to dunk them in coffee! The traditional recipe uses no butter, oil, or milk, but in my recipe I have used butter, and a little bit of oil. I also have no actual almonds in these, just the flavour, and lots of chocolate chips. I prefer the flavour over the actual nuts. 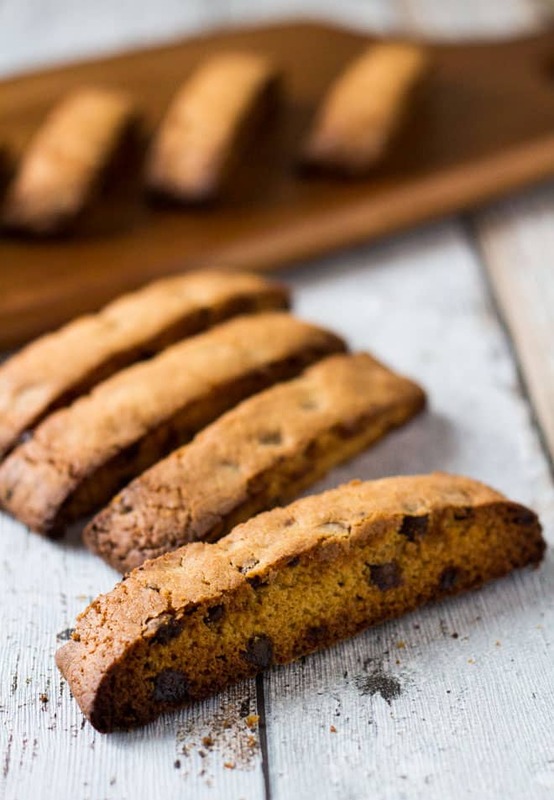 Biscotti means twice-baked because they are first baked as a whole (oblong-shaped), then baked again as slices. Baking them twice is what makes these cookies deliciously crunchy, and dunkable! Twice-baked crunchy almond flavoured Biscotti studded with chocolate chips. Perfect tea or coffee dunkers! Preheat the oven to 190C/375F/Gas 5. Line a baking tray with parchment paper, and set aside. Whisk together the flour, baking powder, and salt. Rub in the butter until well combined. (You may use a food processor). Mix in the sugar, and chocolate chips. Add the egg, oil, and almond extract, and mix to form a soft dough. Turn onto a lightly floured surface, and form into a roll, about 25cm (10") long. Transfer to the prepared baking tray, and press gently to flatten to a depth of 2cm ( 3/4"). Bake for about 20 minutes until lightly browned. Cool for 10 minutes, then carefully cut into 10 - 15 slices. Place the slices back on the baking tray, and bake for a further 5 - 7 minutes until crisp. Turn them over, and repeat. Let cool for a few minutes before transferring to a wire rack to cool completely. Cookies stay fresh, in an airtight container, at room temperature or in the fridge for up to 1 week. They also freeze well for up to 3 months. Thaw overnight in the fridge. 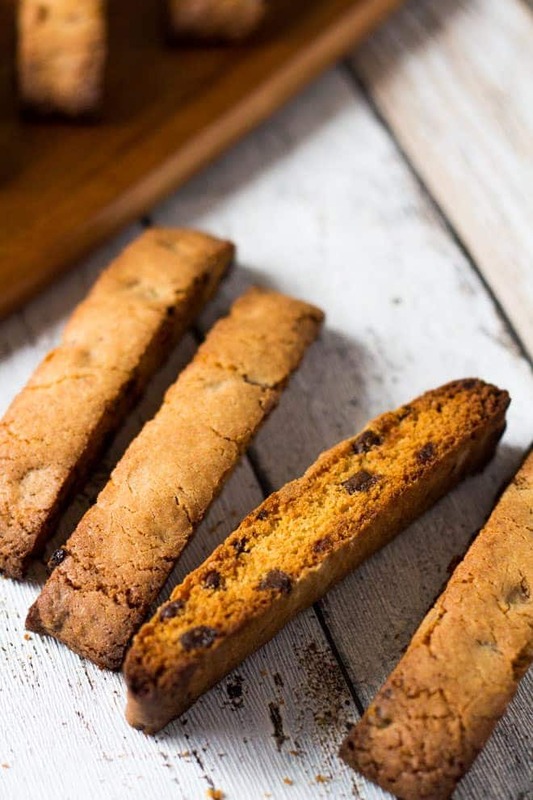 I adore biscotti, and these classic flavours sound perfect! These sound FANTASTIC! Definitely saving for later! These look so crunchy and delicious! Oh yum! I LOVE biscotti, but for some reason have never made it from scratch. Your recipe sounds absolutely perfect as chocolate chip anything is my favorite! I just wish I could reach through the screen to grab one to have with my tea right now! So delicious! These would be perfect for dipping in my morning or afternoon coffee. Pinned! 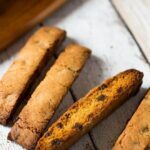 This Italian girl loves biscotti and this recipe looks delicious! Yum! I love biscotti, and these look fantastic! I’ve never had biscotti before. At least I don’t think I have. But I do love almond biscuits. Oh, I loveeeeeeee dunkable cookies especially in milk tea. Too good. I love dunking cookies in tea, too. So yummy! They look so crunchy and super delicious. Would love to have some right now 🙂 YUM!